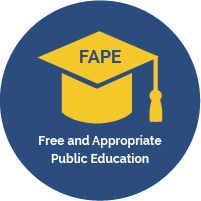 IDEA guarantees that eac h child with a disability, eligible for special education, will be entitled to a free appropriate public education (FAPE). Free requires that the education of each child with a disability must be provided at public expense and at no cost to the child’s parents. The only exception is that incidental fees normally charged to non-disabled students or their parents as part of the regular education program may also be charged to students with disabilities and their families. Appropriate means that each child with a disability is entitled to an education that is “appropriate” for his or her needs. “Appropriate education” is determined on an individual basis and may not be the same for each child with a disability. Public refers to the public school system. Children with disabilities, regardless of the nature or severity of their disabilities, have the same right to attend the public schools as their non-disabled peers. The public school system must educate students with disabilities, respond to their individual needs, and help them plan for their future. Education - IDEA is an education act that guarantees that eligible children with disabilities will receive a public education that includes special education and related services as directed by the child's Individualized Education Program (IEP), based on the child's individual needs.